VIBRANT, COLOURFUL , SPARKLING BRAZILIAN LIVERPOOL SAMBA DANCERS FOR EVENTS! 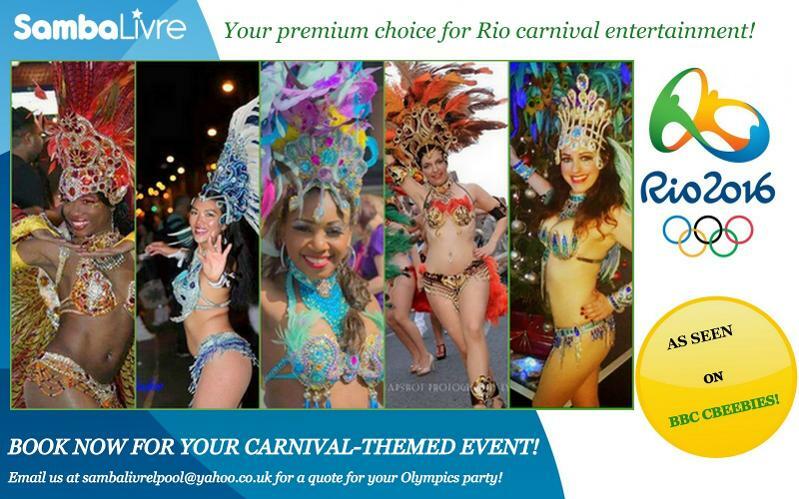 Energetic Rio Carnival music and UK samba dance shows, Latin Dancers & Brazilian Entertainment! FEATHERS, COLOUR, SPARKLE AND ENERGY! 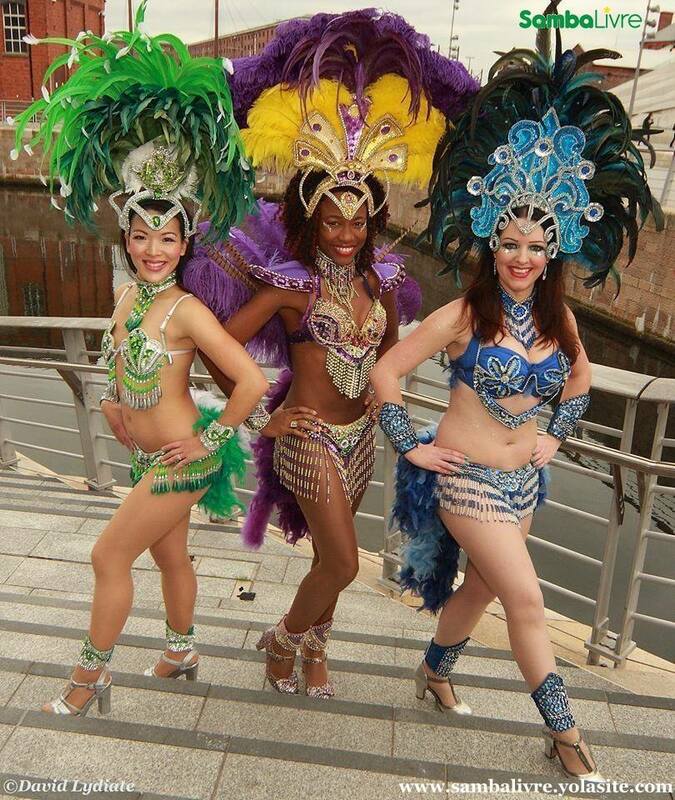 BOOK SAMBA LIVRE' S LIVERPOOL SAMBA DANCERS FOR YOUR EVENT ENTERTAINMENT! 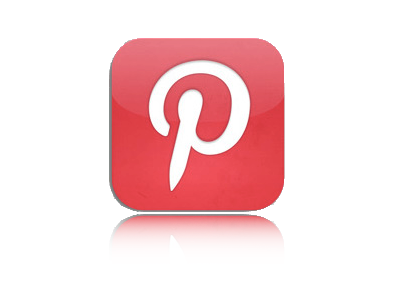 MAKE YOUR WEDDING TRULY UNIQUE! 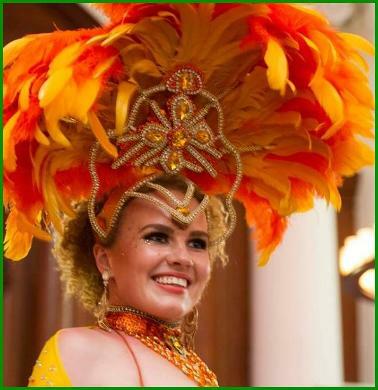 Samba Livre Liverpool Samba Dancers are offering brides a fabulous Brazilian carnival hen party session PLUS Rio samba show wedding entertainment deal! Book your wedding entertainment and hen party session with Samba Livre's Liverpool samba dancers and receive a special samba show deal! 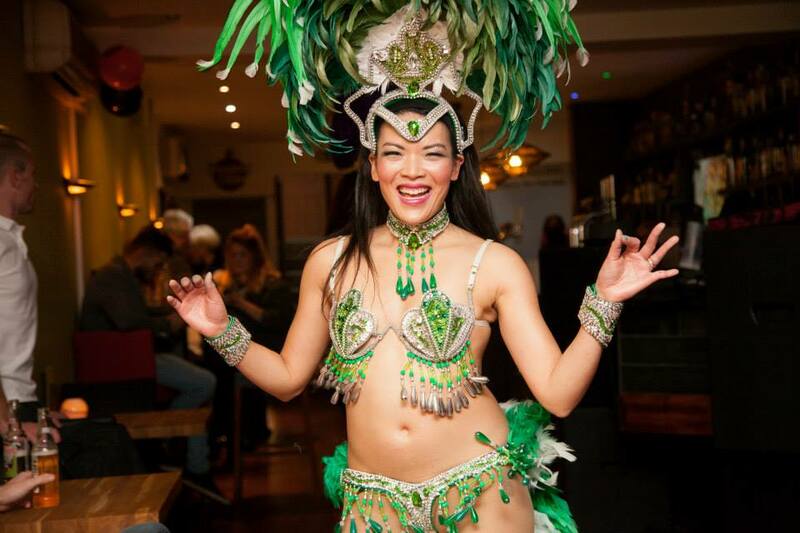 Samba Livre Liverpool Samba Dancers give Rio samba hen party sessions which are extremely popular and guarantee a fun-filled Brazilian carnival dancing activity for both the hen and her bridesmaids! 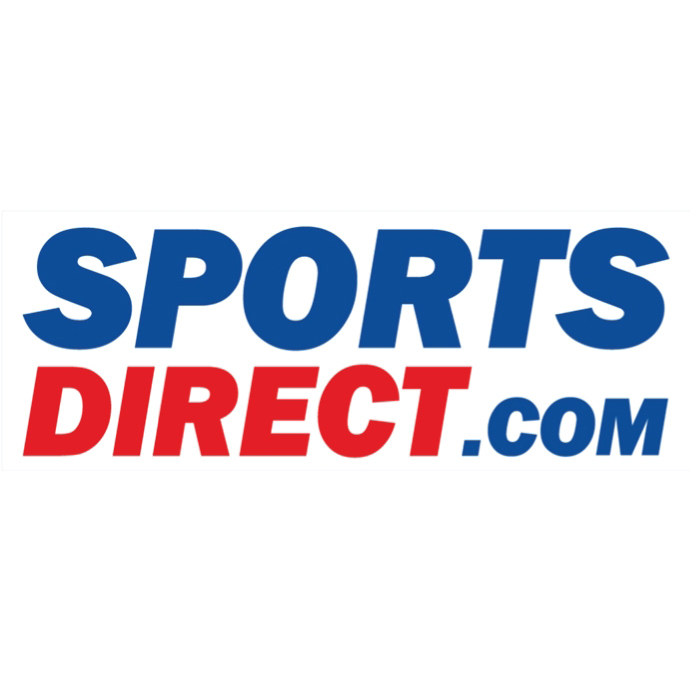 Fancy a chance to try on the Brazil carnival feathers and tropical headdresses that Samba Livre Liverpool Samba Dancers and Liverpool samba shows use in their UK samba shows? 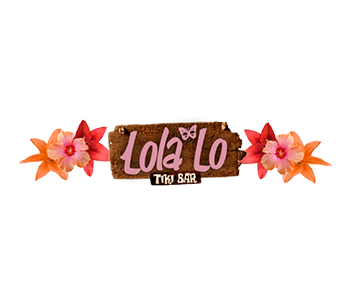 If you like the sound of dancing like Samba Livre Liverpool Samba Dancers, bring a touch of Rio carnival glamour to your hen party and the big day itself. 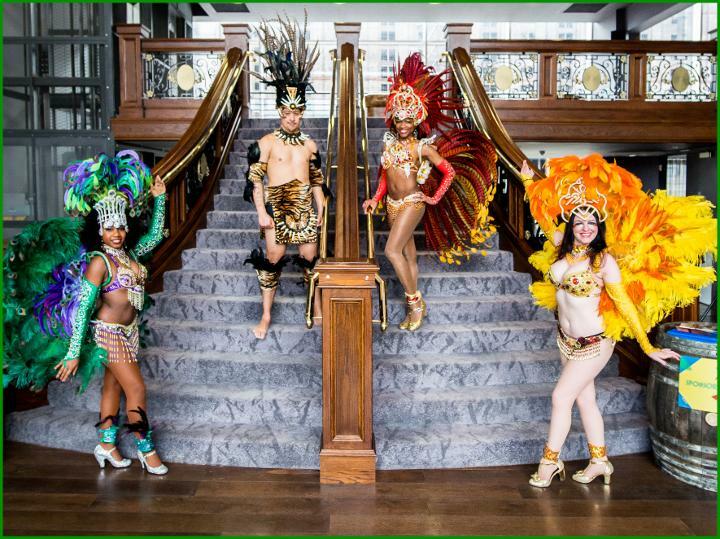 Combine our vibrant Samba Livre Liverpool Brazilian dancers with your wedding reception and give your guests a night to remember with fabulous UK samba dancers. We always leave a happy bride behind and may even let her try on our wings! 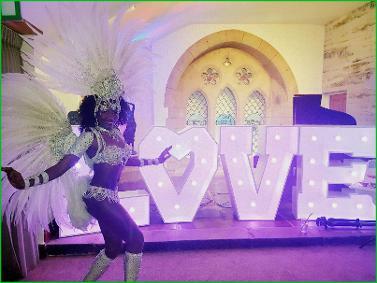 Your wedding photos will be spectacular with our samba dancers from Liverpool and Samba Livre's UK Brazilian dancers will ensure your special day stands out! 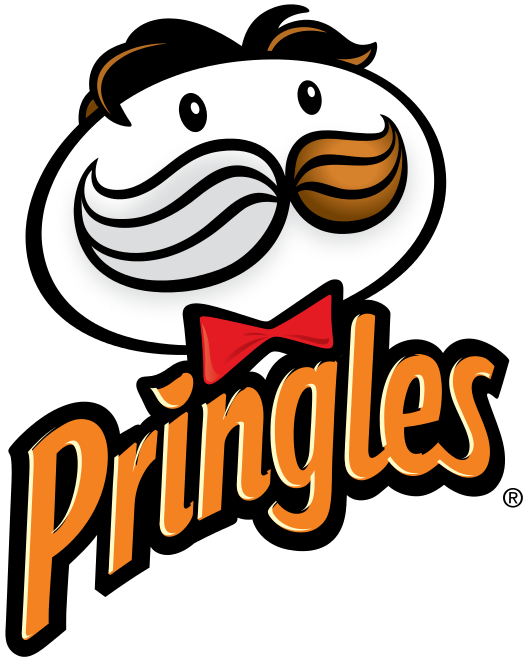 Don't fancy the package? 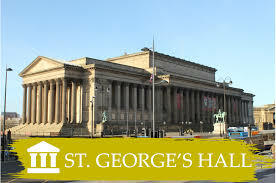 Our Liverpool samba dancers also offer hen parties in Liverpool and wedding entertainment separately across Liverpool, Merseyside, Manchester, Wirral, Cheshire and the UK in general. Wedding season is the busiest time of year for our Liverpool samba dancers, BOOK NOW! 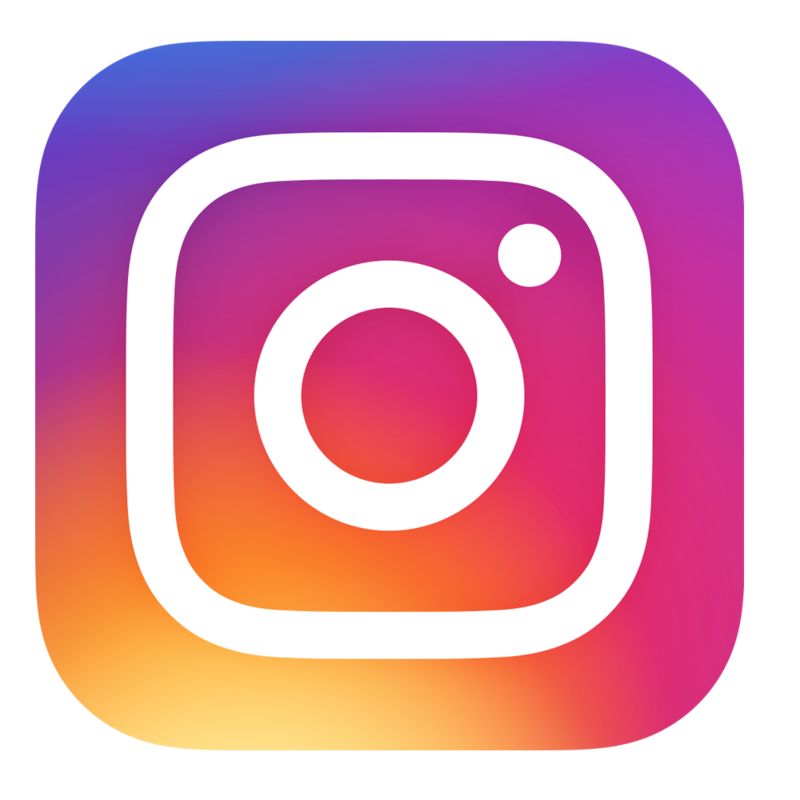 Samba Livre Liverpool Samba Dancers are top UK Brazilian dancers and our Liverpool samba show makes us the best samba dancers in the North West and among the most prestigious UK samba dancers. Samba Livre Liverpool Samba Dancers, Liverpool samba shows and UK Brazilian Carnival Dancers feature in the official promotions for Aldi UK as sponsors of TeamGB at Rio Olympics 2016. Our Brazilian dancers from Liverpool perform in authentic Brazilian samba costumes. Samba Livre UK Brazilian samba dancers Liverpool perform their Liverpool samba show on BBC CBEEBIES' Show Me Show Me Birds of Paradise and Carnivals episode. 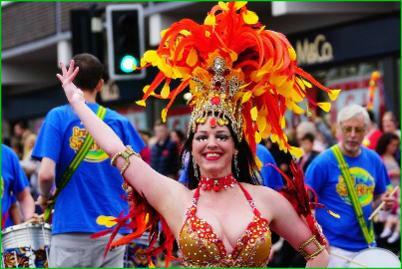 Our Liverpool samba dancers are trained Brazilian dancers from the North West and guarantee a fun-filled samba show! 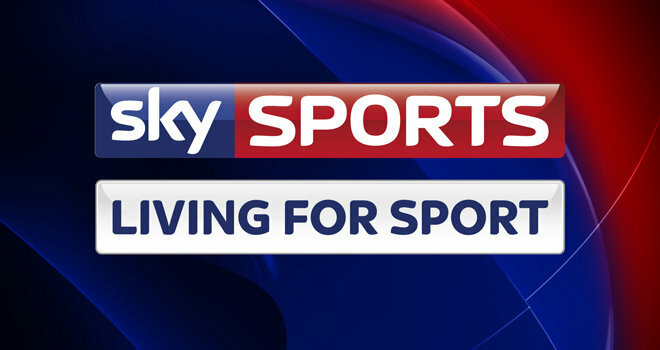 Samba Livre Brazilian dancers Liverpool and their glittering Liverpool samba show in the UK feature in this Sky Sports News clip presenting the Living for Sport Student Award in Wales. Samba Livre UK samba dancers based in Liverpool perform their sparkling UK samba show, featuring their beautiful Liverpool carnival show dancers, across the UK, making them not only the most reputable samba dancers in Liverpool, UK, but also among the top rated UK Brazilian dancers nationwide and one of the most energetic samba shows in the UK - a Liverpool samba show mixing Brazilian vibes with Liverpool vibrancy! 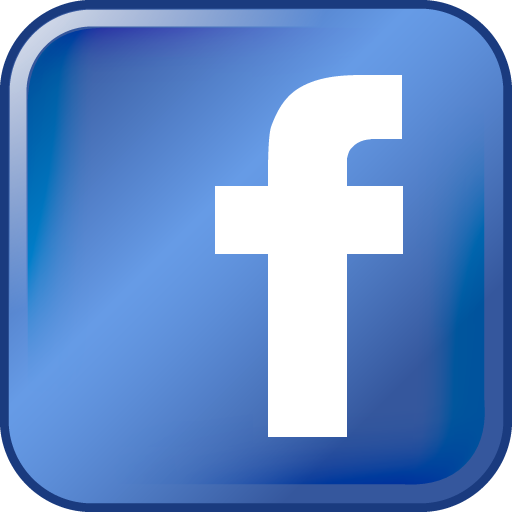 Premier Brazilian entertainment - the best Brazilian samba dancers and carnival performers in Liverpool and the North West! 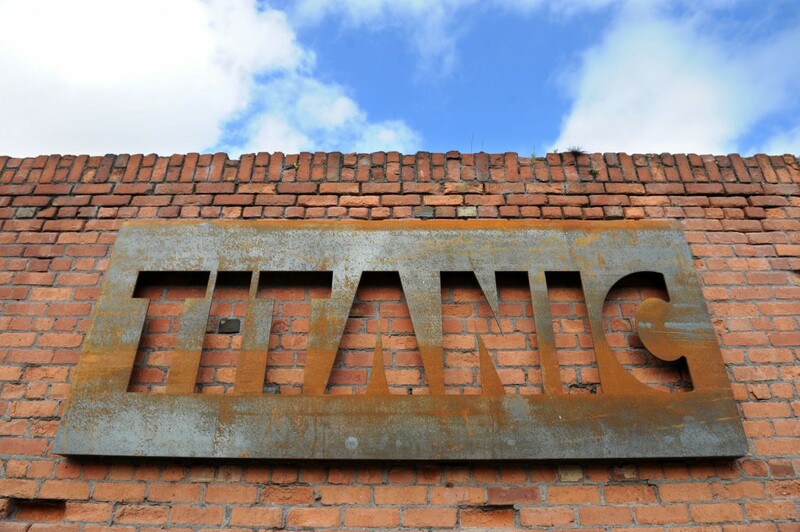 BOOK NOW FOR SUMMER 2019 ENTERTAINMENT AND EVENTS! 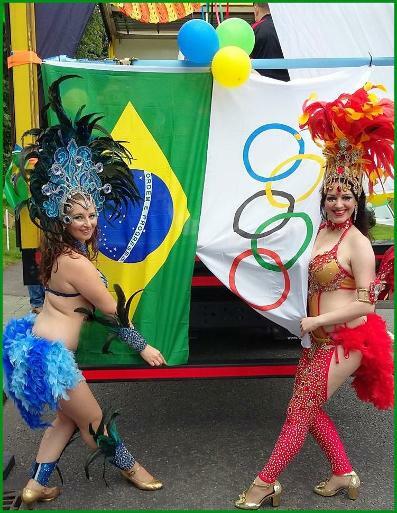 Carnival Passion... Brazilian Beats... LET SAMBA LIVRE LIVERPOOL SAMBA DANCERS TAKE YOU TO RIO WITH OUR NORTH WEST SAMBA SHOW! From Latin America to Liverpool and the North West... our Liverpool samba dancers have performed at Rio Carnival! 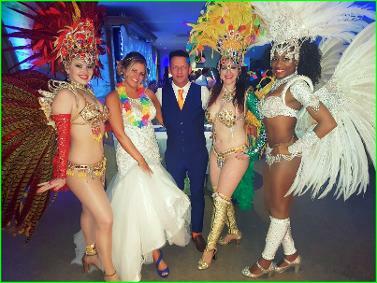 Book Samba Livre's UK Brazilian samba dancers for your event! 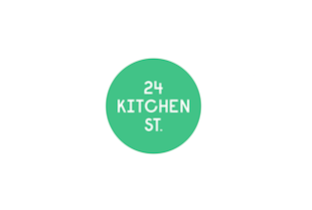 Samba Livre Liverpool Samba Dancers are top UK Brazilian dancers and their Liverpool samba show makes us the best samba dancers in the North West and among the most prestigious UK samba dancers. Samba Livre Liverpool Brazilian carnival dancers & Rio shows at the Titanic Hotel, Liverpool, Merseyside (March 2016). Our Liverpool samba dancers brought an explosion of energy, colour and feathers to the event with their samba show and Brazilian dancers from Liverpool. 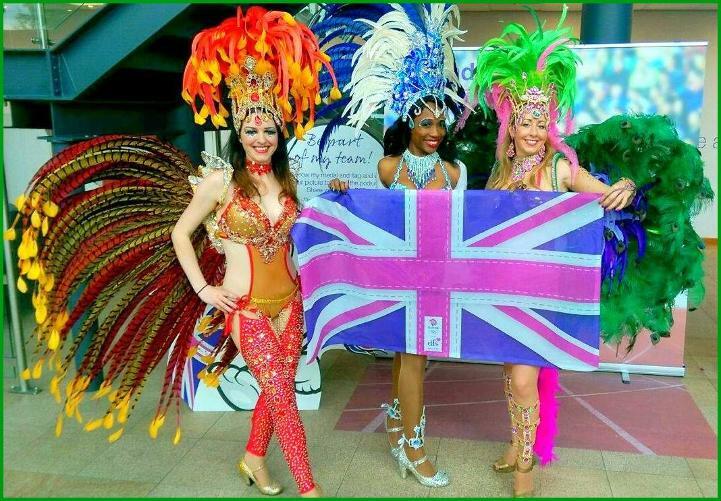 Samba Livre Liverpool Brazilian carnival dancers & Rio shows at the DFS promotion as official sponsors of Team GB at Rio Olympics. 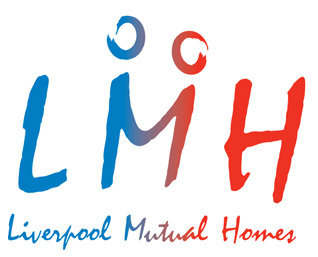 Our Brazilian dancers from Liverpool were chosen to perform their Liverpool samba show. 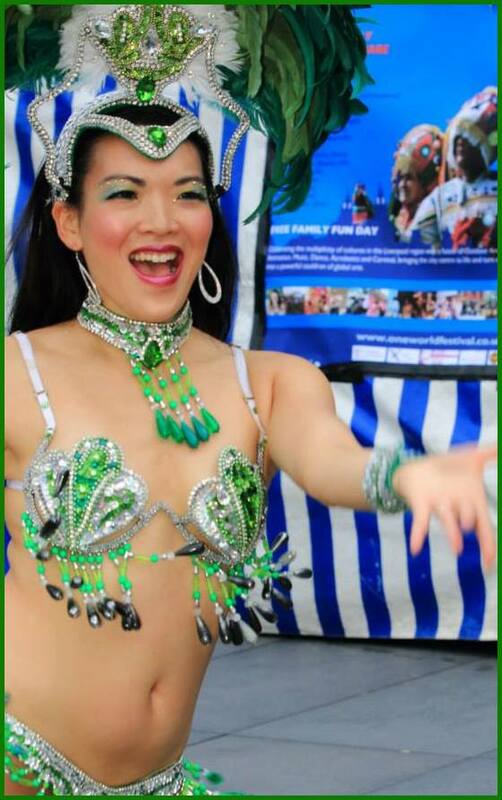 Our samba dancers are North West carnival in the UK! 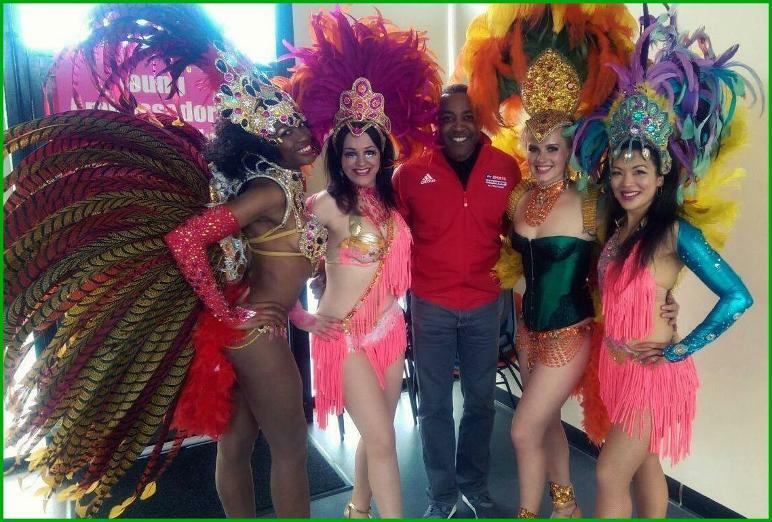 WHY SAMBA LIVRE LIVERPOOL SAMBA DANCERS AND NORTH WEST SAMBA SHOW? Samba Livre Liverpool Brazilian Samba Dancers have years of Brazilian samba training, feature local talented samba dancers from the North West, Liverpool and beyond, and perform electrifying routines with our troupe of Liverpool Latin samba performers and UK samba dancers and entertainers - something that sets our Liverpool samba dancers apart from other groups - in an explosion of feathers, sparkle, colour and energetic Rio Carnival charisma! Samba Livre's Liverpool samba dancers are easy to work with, extremely approachable and open to any ideas you may have in mind! 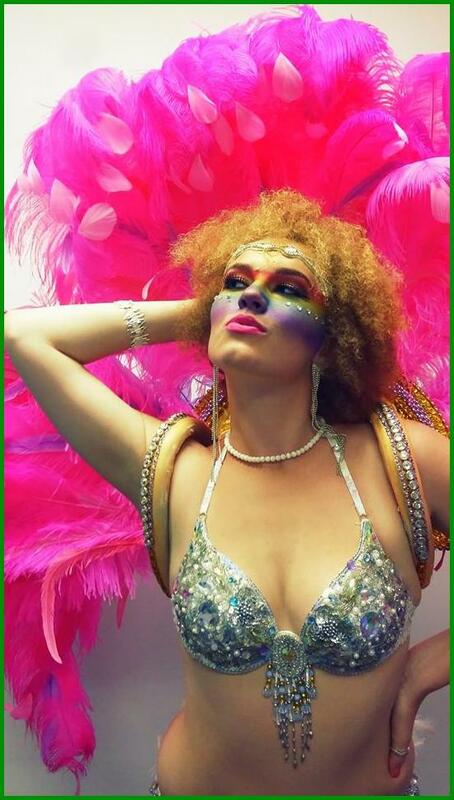 Our UK Brazilian dancers are not just about fabulous costumes and a wealth of performance experience... quite simply, Samba Livre's UK samba dancers are THE BEST RIO SHOW IN THE NORTH-WEST! Liverpool samba dancers available to hire across Liverpool, Merseyside, Manchester, Cheshire, Lancashire, England, Wales, Ireland and the UK in general. 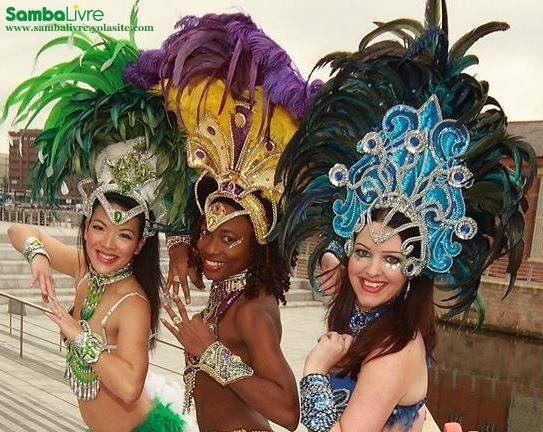 Samba Livre Liverpool Samba Dancers are top UK Brazilian dancers & their Liverpool samba show makes them the best samba dancers in the North West & among the most prestigious UK samba dancers. 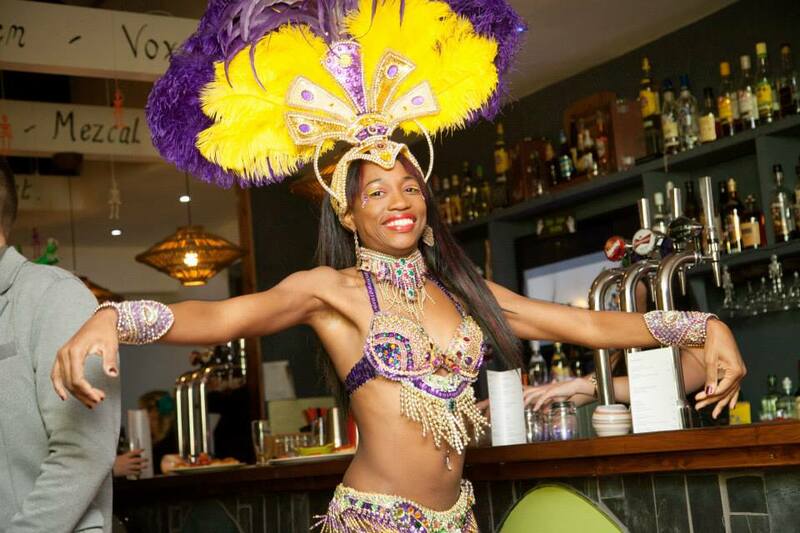 Hire our samba dancers from the North West & see the difference! 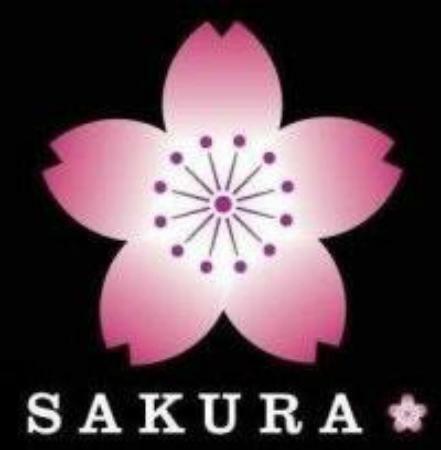 Samba Livre Liverpool UK Samba Dancers & their North West samba show will amaze you. Premier Brazilian entertainment - the best Brazilian samba dancers & carnival performers in Liverpool & the North West! David Lydiate Photography: Samba Livre Liverpool samba dancers in the first shoot for their Liverpool samba show back in 2013! LADIES! Samba Livre's Liverpool samba dancers offer hunky MALE UK LATIN DANCERS. 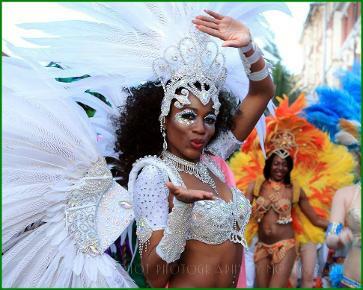 Mix up your UK Brazilian carnival dancers with both girls and guys for a unique UK Rio samba show experience! Samba Livre Liverpool samba show & Brazilian dancers Liverpool know how to party! 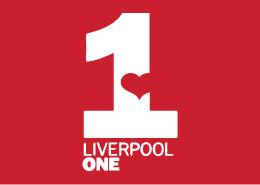 Samba Livre Liverpool Samba Dancers are top UK Brazilian dancers and their Liverpool samba show makes them the best samba dancers in the North West and among the most prestigious UK samba dancers. 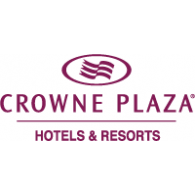 BOOK NOW FOR 2018 ENTERTAINMENT AND EVENTS! Samba Livre Liverpool Brazilian Carnival Dancers and Rio shows at the World Cup-themed Sports Direct Annual Conference (May 2014). Samba Livre Liverpool samba dancers & Brazilian dancers were asked to take their incredible Liverpool samba show from the North West to the North East to perform their Brazilian dancing spectacle! Our samba dancers from Liverpool perform in a dazzling array of Brazilian dancing costumes in a high-energy show! 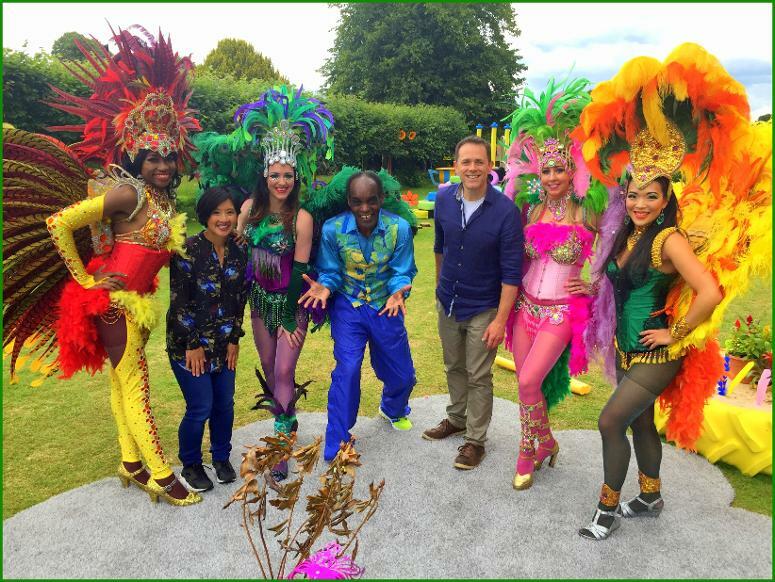 Samba Livre Brazilian Carnival dancers at a commercial shoot for the official sponsors of Team GB at Rio Olympics 2016 (March 2016). 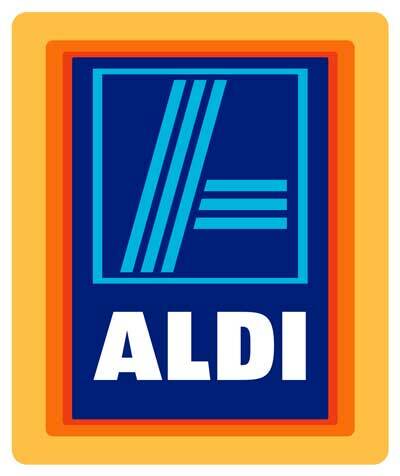 Our vibrant Liverpool samba dancers and Brazilian dancers combined their sparkling Liverpool samba show in the North West with capoeira (Brazilian martial arts) for Aldi UK's Rio Olympics 2016 advertising campaign. 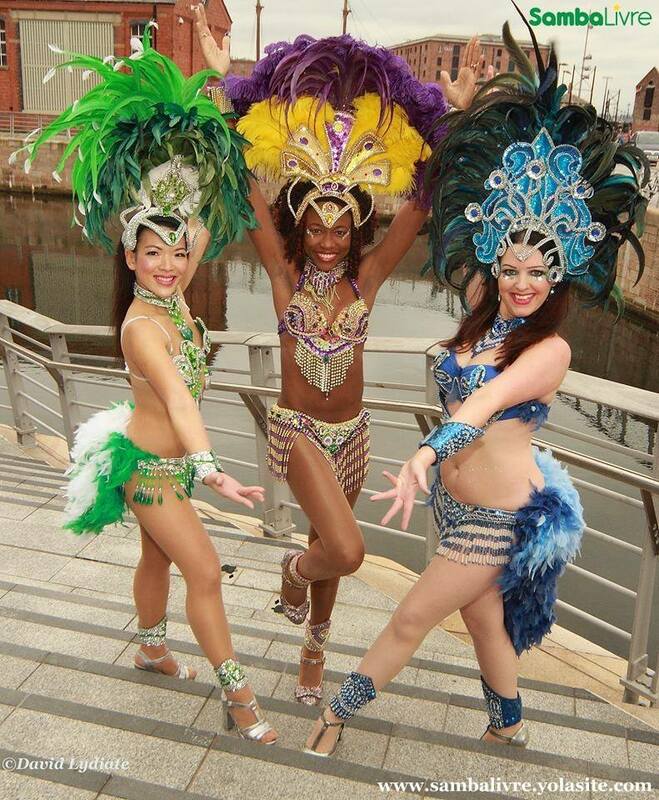 Our samba show from Liverpool features beautiful Brazilian dancers based in the North West. Samba Livre Liverpool Samba Dancers perform their Liverpool samba show, which ranks them among the UK's top samba dancers & UK Brazilian dancers. Samba Livre UK samba dancers based in Liverpool perform their sparkling UK samba show, featuring their beautiful Liverpool carnival show dancers, across the UK, making them not only the most reputable samba dancers in Liverpool, UK, but also among the top rated UK Brazilian dancers and one of the most energetic samba shows in the UK - a Liverpool samba show mixing Brazilian vibes with Liverpool vibrancy! 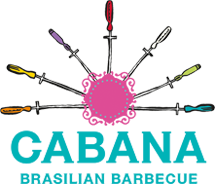 Premier Brazilian entertainment - the best Brazilian samba dancers and carnival performers in Liverpool and the North West! Pictures on this website courtesy of friends of Samba Livre Liverpool Samba Dancers, UK Brazilian Dancers and UK samba dancers: David Lydiate Photography, Bob Croucher, James Broome Photography, Shine Pix Ltd, Daniel Parker Photography, Tony Bignell Photography, KapnKaos Too, Wayne Brocken, Tim Baker, Ian Murren, Matthew Phillips Photography, Nikki Cotter Hull, Alan Henaghan, Steve Bridge, Julie Tyrer, Tim Francis, Teltone Photography, James Wells, Jeff Wong, Liverpool Echo News, Richard Cooper, Matthew Hart Photography, Warren Millar Photography, Christopher Middleton Photography, Terry Hindle, Blue Thumb Photography, Take That Photography, Steve Bridge/TBL Photography, David Ellison Photography, Andy VonPip Photography, Frank Topping, Double E Photography, John Ayliffe Photography, Ian Pendleton, Phil Jenkins - huge apologies if we've forgotten anyone!